My 12 year old daughter and I are out back by the fire pit. It took us two trips to and from the kitchen, but now everything’s laid out: graham crackers, marshmallows, Hershey bars, telescoping metal prongs with the wooden handles, box of long matches, a couple sheets of aluminum foil and the key to the gas starter. I’m about to turn on the gas when I hear the garage door go up and my husband’s car pull in. When he comes back out, I know he’s brought the regular kind of matches since that's the only kind we have inside. No point telling him I’ve already got matches -- the long ones I bought especially for fire pit-lighting, the ones from the back of drawer next to the barbeque, same as where we keep the starter key. I feel a little pang of self-reproach as I see him rummaging through drawers before joining us at the fire pit. Looks like my assessment was too hasty, and he's looking for the long matches after all. “I have it!” I holler back, careful my tone betrays no trace of my mounting annoyance. But he just stands there for a minute like he doesn’t quite believe me. “I’ve got the key,” I add so there’s no confusion and go ahead and slide the key into the slot on the side of the fire pit. I’m sort of feeling around for the little notch inside while my daughter readies two graham crackers and a square of chocolate. A year of Girl Scouts, a couple weeks of sleepaway camp: The girl knows what she’s doing. “You’re a real pro,” I say. I wish I could say the same for me. Installing the fire pit was his idea when we re-landscaped last year, and it hasn’t gotten much use. I can’t remember which direction to turn the key. I try clockwise first, and when the notch doesn’t budge, I try the other way. I feel it turn, just more stiffly than I expect. By this time, he’s seated on the bench behind me, and I’m crouched low for better leverage on the key. “You have to turn clockwise,” he instructs. No point telling him he’s mistaken. When I hear the click-click-click and the whoosh of the gas coming on, I reach for one of my long matches I bought for especially for the purpose of keeping my hand far from the flame, and I strike it against the rough paper on the side of the box. “You’ve got the gas too high!” he snaps. I’m so startled by the harsh urgency of his voice that I check to make sure my hair’s not on fire as a row of white flames leaps to life. “You really don’t need to micromanage the marshmallow-roasting,” I say and instantly regret it because in the same moment my husband’s on his feet. “I can see I’m not wanted here!” he snaps. Our daughter freezes, eyes on the fire as her father strides off across the yard. “Oh, come on! You are wanted!” I call after him. The screen door slams his reply. 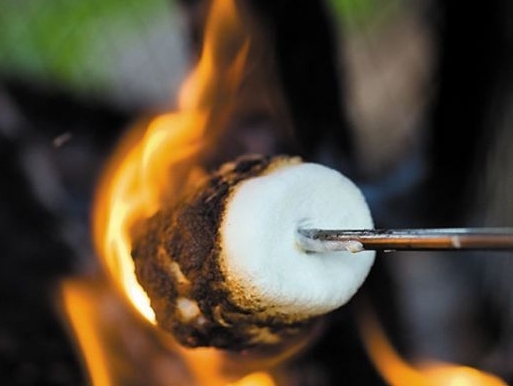 After a moment, she reaches into the bag of marshmallows and wordlessly threads one onto a telescoping roasting stick, positioning the marshmallow a quarter-inch above a flame. Inside, the lights to the den flick on. “He didn’t need to do that.” I say softly. “I know,” she replies, a seasoned diplomat, calmly contemplating her marshmallow, patiently awaiting her favorite shade of char.